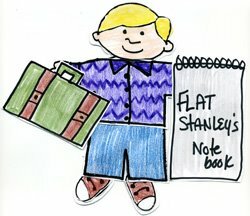 Oi [oh-ee] (that’s hi in Portuguese), Flat Stanley reporting in with the help of my pal, Kaylea Hutson from Maceio, Brazil. When we left Joplin, it was cold and rainy. Here in Brazil, the temperature is in the 70s and 80s, with sunshine. Maceio is located on the Atlantic Ocean, in the state of Alagoas. It sits on a jagged peninsula between the Lagoa Mundau and the ocean—I hope I’ll get to see the ocean before I come back to Missouri. I’m learning to say a few words in Portuguese—which is kind of like a mixture of Spanish and French. They say I have a sotaque [soh-tah-kee], an accent, when I try out the new words. Hopefully, I’ll get to learn how to play futebol [joo-chee-bah-ohh] or what we know as soccer. The boys at the orphanage play it a lot, and I want to take some lessons from them—so wish me boa sorte [boh-ah soh-chee] good luck, because I think I’ll need it. I’ll write more about my adventures later this week. To my pals in Patty Meintel's fifth grade class at Emerson Elementary, [and anyone else] you can send me notes through Kaylea at kaytebug2002@yahoo.com. She promises to check her e-mail for me. Hopefully I’ll learn how to falar [fah-lah] to speak or to talk a few more Portugese words before my next message. It finally hit! I'm going to Brazil!